First, apologies for not updating in so long (there may in fact be very few of you actually reading this anymore due to my lack of commitment). So these are just some things I’ve been musing over. #1: Jobs. The job application business is beginning. So far, there are two I really like. One is in London and I’ll actually get paid. The other is in Strasbourg and it’s an unpaid internship. I seriously doubt I will be returning to Toronto for good in August. I’ll still be returning for my cousin’s wedding and some general meet-and-greets with my beloved family and friends, but then I will likely be jetting off somewhere else. My top choices are: London, New York, or an on-the-ground position in Africa or South America. 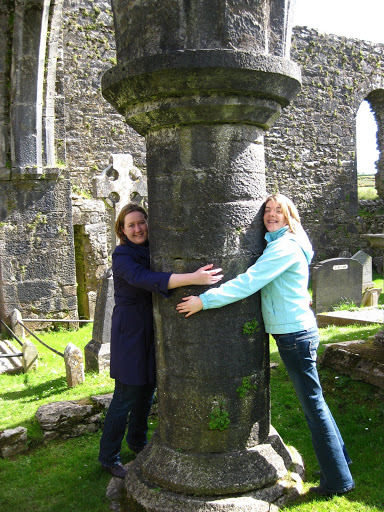 This is me and Deirdre hugging part of a ruined monastery in Co. Cork over Easter. #3: I don’t know how we got on this topic, but some of my friends and I started talking about when people get engaged (in a heterosexual relationship) and the guy goes to ask the girl’s parents for permission. Everyone thought it was a sweet gesture, except for moi. I got my feminist claws out and started ranting about how that stems from when women were property and how offensive it is and blah blah blah. Seriously, if a boyfriend ever did that in my situation, I would seriously have issues ever accepting his proposal. I may never. Because he really wouldn’t know me if he went and did that. It’s not sweet, not traditional – it’s archaic! You’re marrying ME, not my parents! Get my permission, not theirs! Ok, ok…rant over. So I brought it up with some of my friends after class yesterday and got a different reaction. The two girls I talked with both agreed with me that it was not such a “nice” idea. It was after my Human Rights of Women class, so I could have seen that coming. But still, I wanted some assurance that not all women think like that. Ok, so maybe I seem a bit extreme to some people. But I still think it’s offensive. #4: In other news, Fred Phelps and Shirley Phelps-Roper have both been banned from entering the UK. If other members of their family decide to come, the UK has said it will consider banning them too. Hallelujah!!! Posted on May 6, 2009, in London Life 2008-9. Bookmark the permalink. 2 Comments. Heh… if anyone asked my parents whether he could marry me, my parents would say, “Uh… haven’t you asked her?”*shakes head amusedly*In other news… I hear that Africa and the UK are moving into Toronto, so if you want to work there, you’ll have to work here! So just move back already! Riiiight? Hmm…this is amsuing because culturally (and bollywood movies will show you this) parents negotiate “alliances” – but when my dad went to my mother’s parent’s..they were like “umm..if she’s ok w/ it, we’re ok w/ it” – generally the asking the parents part, happens after you’ve confirmed that your potential fiancee is in agreement.My response would be general amusement…and depending on the suitor my parents will either be relieved or utterly shocked.